It takes a lot of discipline and dedication to run a blog properly and that is one of the main reasons why I admire bloggers and tech gurus like Chris Webb (who has been putting out high quality blogs for ages in a consistent manner!). Sadly, I am not very disciplined when it comes to writing blogs and it takes a significant external force to make me write nowadays. 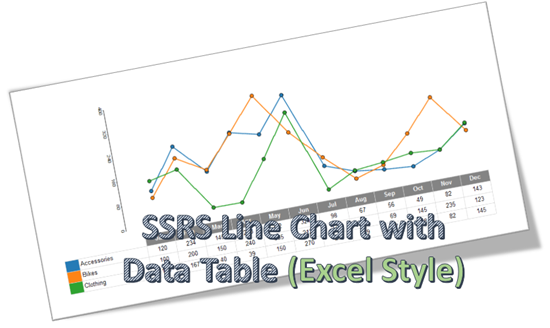 I had written a blog almost 3 years ago on how to create SSRS charts with data tables like in Excel and from then onwards, I have had a lot of readers ask me on how to do the same with line charts (both through comments as well as emails). I knew it was possible but was too lazy to write a blog on it, until I had 2 readers ask me the same question yesterday in the comments. Finally, I decided to check it out and write about it. The solution is not perfect and is more of a workaround but should be ok for most of you I guess. For illustrating the solution, I am using a simple dataset which shows the sales by Product and Month. To follow this solution, you must be familiar with the technique I mentioned in the previous article. If you have not read that, please the previous article first and then follow the steps below 1) A lot of readers already found out that if the technique described in the previous article was used, then we will only get points and not actual lines. So, the very first step here is to modify the source query such that for every actual point in the line chart, we get 2 more points which gives the start and end for that point. With this, now we will have a line joining 3 points for what would just have been one point before. Note that LeadSales column is actually the (Sales for next point + Sales for Current Point) / 2 and LagSales column is actually the (Sales for previous point + Sales for Current Point) / 2. This will help us get a smooth line when we join our different lines. Also, we have to ensure that for the first and last points, NULL values are assigned. The bottom part of the query brings all three columns (Sales, LeadSales, LagSales) into a single column called Sales but each one is assigned a different Type. 2) Repeat the steps 2 and 3 in previous article to make the matrix and the two rows above it. Also add the Type column to the row group, delete the columns only and then filter the Type group for 2 only. The reason is that we only want the actual Sales to be shown in the data table, which is 2. Type 1 and 3 are used for the sole purpose of making the line chart. 3) Now you should be able to follow the rest of the steps in the previous article with the sole exception that you will be using a line chart and not a bar chart. Make sure that you set the CustomInnerPlotPosition and CustomPosition appropriately like in step 10 in the previous article, so that graph appears continuous. I used the below settings for this line chart. 4) Instead of step 11 in the previous article, I chose to make a new column to the left for the vertical axis, and just made sure that the vertical axis for the line charts all have the same scale. Note that the series expression for this column is just 0, and there are no category or series group. This ensures that we just get a dummy line for the axis. You can start hiding the orders to ensure that the graph looks continuous. 5) I also added an expression such that the markers and tooltips only show if the type is 2. This should be good for most people. However, there is one minor drawback which is that the lines do not join that smoothly. I have just zoomed in one part so that you can see the issue. Maybe, this could be solved by fiddling along with the properties some more, but I feel this is not that big of an issue. It looks like you have not followed the first step correctly. The first step should create 2 extra points for every category, which is what helps in creating the line. Can you revisit that and check? Thank you for the article – most helpful, exactly what I was looking for. Unfortunately, I ran into a problem – the line is not connecting between matrix cells. I do have 3 points in each category, and the line is there, but not connecting. Looks like there is a margin, or a padding that I cannot get rid of. I checked the CustomInnerPlotPosition and CustomPosition, and they are set to 1,1,100,100. Any ideas? Thank you again! Thank you for the post. It is very helpful. Very nice article and helped a lot to create such scenario. However I am somehow stuck where David stuck. My lines are not connecting with each other, although I have 3 points for each category. I took off margins for both Horizontal and vertical axes but still no luck. Could you please help with the same. I guess I can’t put the screenshot here, otherwise I would have shown you what I am getting. Thanks. Hi, Could you give me please the copy of this report. I'm having an Issue with the plots. Thanks. can you please provide your .rdl file for reference? I try with my personal dataset but, in the first step, I don’t understand what it’s Src and . Can we do this in SQL Server 2008 (without lead and lag functions). Hi Jason, is it possible to combine line and bar chart? Hi Jason,I have generated two extra points and also set CustomInnerPlotPosition and CustomPosition. but still, lines are not connecting, so please help me. How will we connect the lines? please find the Screen Shots below. I am also getting the point connects, except not all the charts connecting as per David Kline. Disable Side margin Property of horizontal axis property of line chart graph. Is it possible to show different charts on parallel vertical axis values. In my case I want to show Bar and line chart. Please help ASAP if possible.